Archaeological Perspectives on Political Economies explores past societies that are characterized by hierarchical organization where the production and circulation of goods transcend domestic units. 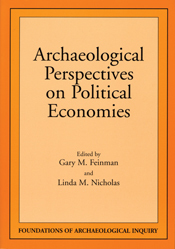 Based on contributions to the biennial Foundations of Archaeological Inquiry Roundtable, Gary Feinman and Linda Nicholas bring together twelve leaders in the field whose contributions consider such questions as the emergence of rank within a previously egalitarian society, the regional organization of preindustrial economic systems, different modes of craft specializations, and the relation between high-status consumption and long-distance trade. Areas of study include most of the core areas of early complex society development, and analytical scales that range from domestic units to macroregional networks, demonstrating how archaeological research and data can help explicate the economic intricacies of past societies. The volume reinvigorates the archaeological investigation of preindustrial economies, offering both new theoretical perspectives and new empirical foundations. Gary M. Feinman is curator of Mesoamerican anthropology and archaeology at the Field Museum in Chicago. Linda M. Nicholas is adjunct curator of Mesoamerican archaeology at the Field Museum in Chicago.